In the world of academia, the number of citations an article receives has long been a recognized measure of success. However, with the emergence of new article metrics, researchers are increasingly looking to usage data (downloads and article views) and other article-level metrics, such as social media mentions, to understand a paper's impact. Last year, Elsevier ran a pilot for a new initiative designed to meet the demand for alternative metrics: the Article Usage Report. Based on the positive results of that pilot, the decision was taken to offer it to all journals on ScienceDirect from the last quarter of 2013. 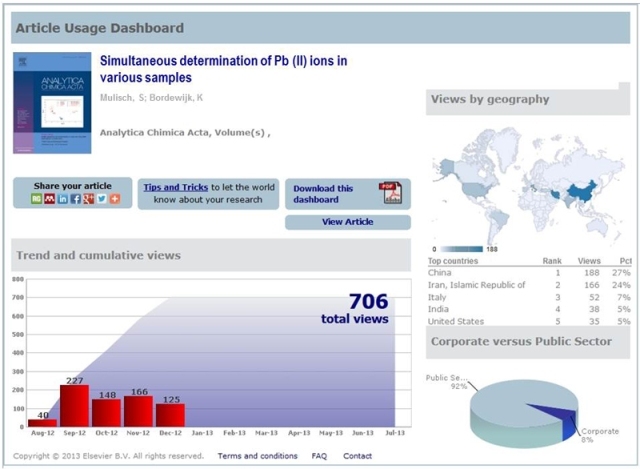 When authors publish with a journal involved in the initiative, they receive an email with a link to a personalized dashboard. There they can view how often their articles have been accessed and by which countries. They can also see whether that access was by the corporate or public sector. Also, the dashboard contains tools to help authors promote their papers via social media channels. Authors will continue to receive quarterly email updates for the first year following publication, but the links to the reports will be updated on a monthly basis, meaning authors are welcome to visit the dashboard between emails. The service is free. The Article Usage Reports complement our existing CiteAlert service, which comes into effect once an author's article has been cited. 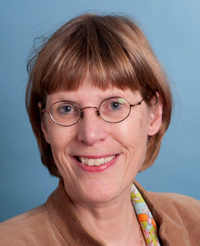 The initiative is the brainchild of Elsevier Life Sciences Publisher Alina Helsloot. In fact, it was the winning entry in an internal Elsevier innovation competition. 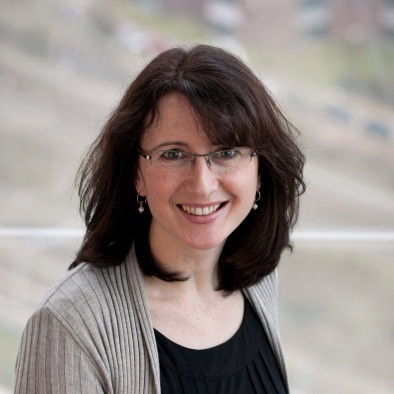 A short while later, it was picked up by Dr. Inez van Korlaar, Director of Project Management for Elsevier's Marketing Communications & Researcher Engagement Department (MCRED), who recognized the opportunities it offered to improve author support. "Instead of making the usage data publicly available like some of our competitors do," Helsloot said, "we decided to go with a more personal approach: a tailor-made update that can only be viewed by the author, giving them the choice whether they want to share the data more widely." She explained that the service will also "maximize the outreach" of journal articles by giving the author tools to promote their papers via social media and then track how successful they have been. Although the reports are designed for authors, others have expressed interest as well. "Our editors were also keen to see this introduced," said Joy Ideler, who launched the project for MCRED. Right after her team announced the pilot, she received emails from her publishing colleagues at Elsevier. One publisher wrote: "This is wonderful news. I have had so many of my editors ask if we would be offering this type of service to our authors and they will be thrilled to hear that this will soon be an option." Another pointed out that she is often asked by societies, editors and authors to provide usage stats by article. "Gives inspiration and encouragement as well." "I think it is a fantastic scheme, it really gives you a greater sense of achievement knowing that people are reading your work." "With time the relevance of numbers will be known and even more helpful." "As an academic demonstrating the reach of your work is critical to tenure and performance reviews. This is very nice to include in a tenure and promotion package." Over 1,800 journals now offer Usage Alerts now and since launching the service, over 150,000 alerts have been sent out to authors. The next step is to explore linking the Article Usage Reports to other services, for example, citations and social media mentions. Another avenue to explore will be the benchmarking of the usage to other articles published in the same journal or field. This is an updated version of an article originally published on Elsevier Connect on 24 September 2013.